A landscape archaeology walk in Hoxne with Edward Martin. A group of Heritage members were given some fascinating practical tuition in landscape archaeology in Hoxne on July 19th, when accompanied by well-known archaeologist, Edward Martin. Edward explained that settlement starts at either the site of a church, or where there is a water supply, e.g. at the confluence of the Dove and Waveney. However, the name Hoxne, meaning ‘heel sinew’ derives from the shape of the landscape and gives the clue indicating Hoxne settlement originated at the church. From the Domesday Book records show that Hoxne had a mid-late Saxon church dedicated to St. Ethelbert and was the Episcopal See of Suffolk. It was almost certainly on the site of the present church. Until C13th Hoxne also had a weekly market and was a very important and thriving village. The vicarage, although moated, is too big for a manorial hall although it is possible that the original bishop’s palace was on that site. During the C14th the palace, now a country seat of the Bishop of Norwich, moved towards the centre of the village to the site where Oakley Park/Hoxne Hall stood. Here they had ‘a palace very fair and gallant, a deer park and flourishing estate’. The deer park at that time was situated on high ground near Hoxne Wood ,and commemorated to this day by the name ’Park Farm’. However, the park did not always satisfy the demands of the hunt so a New Park was established near the palace in C15th. It is the redundant path referred to as Rose Walk that borders the New Park and back of the Low Street properties that is of specific interest to the HHG. It is conjectured that the path may have been the route that pilgrims visiting the bishop at the church may have taken from their boarding house at the Swan. With reference to maps from 1619, 1757 and 1843 Edward pointed out a number of clues to look for. A brick lodge which appears at Lodge Hill on the 1619 map had disappeared by 1757, infilling in the 1843 map. Rose Lane itself runs between a double ditch – the present wall being on the line of one ditch. Edward was convinced that the deer fence shown on the old maps predated Rose Walk. The wall is interesting as the bricks in some parts are extremely unusual. Some very early bricks dating back to the C16th are present as well as 2.5in.bricks which are only found after 1650. He thought some were Tudor and some, such as the Suffolk whites, may be rejects from the Old Brickworks on the Eye Road. The mixture of bricks suggested that the wall was made from reclaimed materials, possibly from demolished buildings such as Hoxne Hall. The 1757 map shows the development of an ornamental Serpentine lake from the Goldbrook, a very fashionable statement of the times. Some of the lime trees bordering Rose Walk are substantial and indicate ornamental planting as they are extremely unusual for the area. On the walk back along Low Street to the church Edward pointed out some interesting features. The facade of Red House actually covers a timber frame, and that test pitting at the front of the Low Street properties is more likely to be fruitful than those at the back, as would the front of the Green Street properties on the other side of the road from the church. 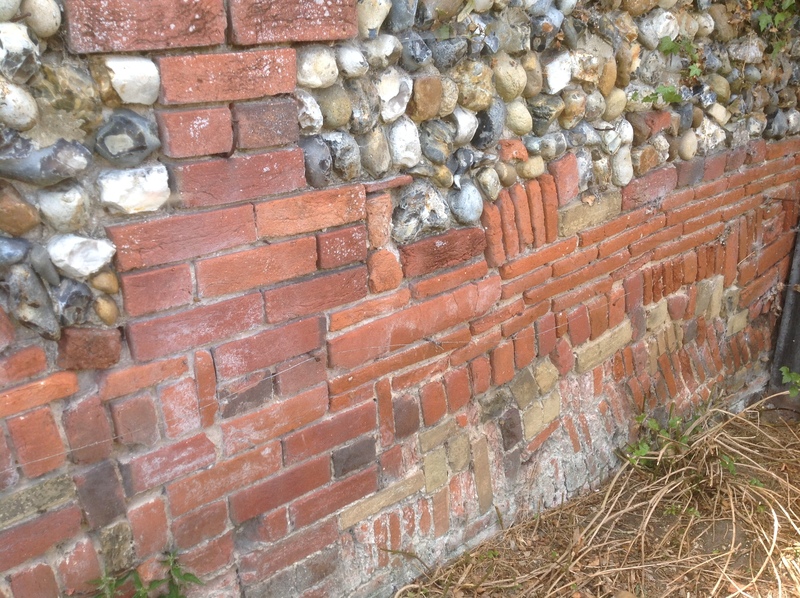 He also talked about the famous Banham walls – the attractive brick walling found in various locations around Hoxne. The walls are built of 9.5in half-round hollow coping bricks set at 90 degrees to their original design in staggered courses. The bricks were made at the Old Brickworks on the Eye Road.
. Examine documentary evidence indicating trades or farms.
. Look at the shape of farms and soil types in the Waveney Valley to get a clue of the meadows.
. Look at listed buildings and John Walker’s survey to add into the equation.
. Look at aerial photographs e.g. the site of the missing lodge.
. Combine tithe and census records.
. Explore manor rolls. Tithe->manor rolls->property designation may give a clue to how things evolved. A truly educational and fascinating tour – we all learnt so much. Edward has suggested that his general chapter on Medieval settlement history in East Anglia in the book Medieval Rural Settlement in Britain 800-1600, obtainable from Amazon, would be helpful in putting Hoxne into its regional context.